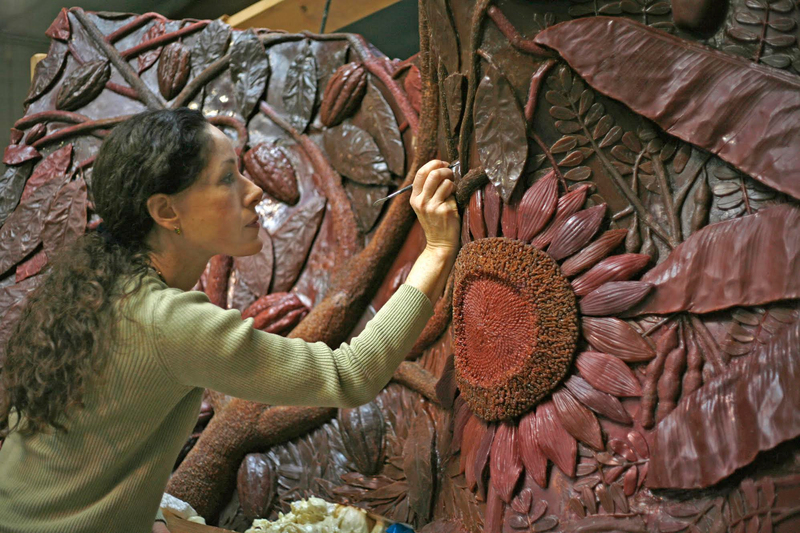 Some of Chicago's top female sculptors will lift the veil on the passion and creative drive that compels them to create public art showcasing the many environs of Chicago in a new lecture series presented by Chicago Sculpture International. Women Sculptors of Chicago - Not for Men Only, debuting Saturday, Jan. 23 at the Chicago Cultural Center, features images, live process demonstrations and discussions presented by 11 extremely creative and talented female sculptors. All of the artists, who are proud members of Chicago Sculpture International, will share their process and passion for sculpture and discuss their public sculptures which encompass a wide range of media including: large scale works in stainless steel, bronze, welded steel, aluminum, carved wood, found and recycled objects, water-works, 3-D mosaics, indoor installations and gallery-sized artworks. January 23: Toby Zallman and Kara James. February 27: Victoria Fuller and Donna Hapac. Fuller working on "Global Garden Shovel." March 19: Janet Austin and Nicole Beck. April 19: Suzanne Cohen-Lange with Niki Nolin and Christine Rojek. May 21: Jill King and Karen Gubitz.